Gold subscribers have access to contracting officer (KO) NAICS purchasing history. A visual chart reflects the amount of opportunities (past and present) that the KO has been associated with. 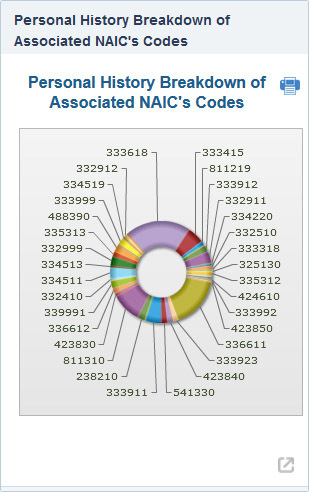 Each color on the chart represents a single NAICS, and hovering over those areas reveals the number of unique solicitations associated with that NAICS for that specific KO. Subscribers with set-asides/socio-economic status can easily locate and track KOs that purchase within their particular NAICS and have set-aside requirements.